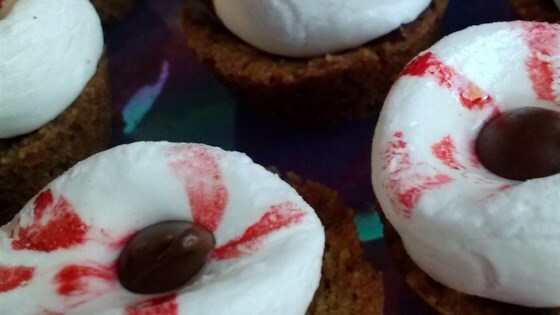 "A deliciously spooky treat that is easy to make and the kids love! Get s'more eyeballs before they are gone; these get eaten quickly!" Stir graham cracker crumbs, butter, and confectioners' sugar together in a bowl; mix until evenly moistened and press into an ungreased mini-muffin pan to form shallow cups. Bake in the preheated oven until the edges are bubbling, about 5 minutes. Break each chocolate bar into 12 equal pieces; place one piece into each graham cracker cup. Paint red circles and lines to resemble blood-shot eyes on top of each marshmallow using red food coloring. Place painted marshmallows, painted-sides up, into graham cracker cups. Press 1 chocolate chip into the center of each marshmallow. Bake in the preheated oven until marshmallows are slightly softened, 1 to 2 minutes. Cool in pan for 15 minutes before removing.